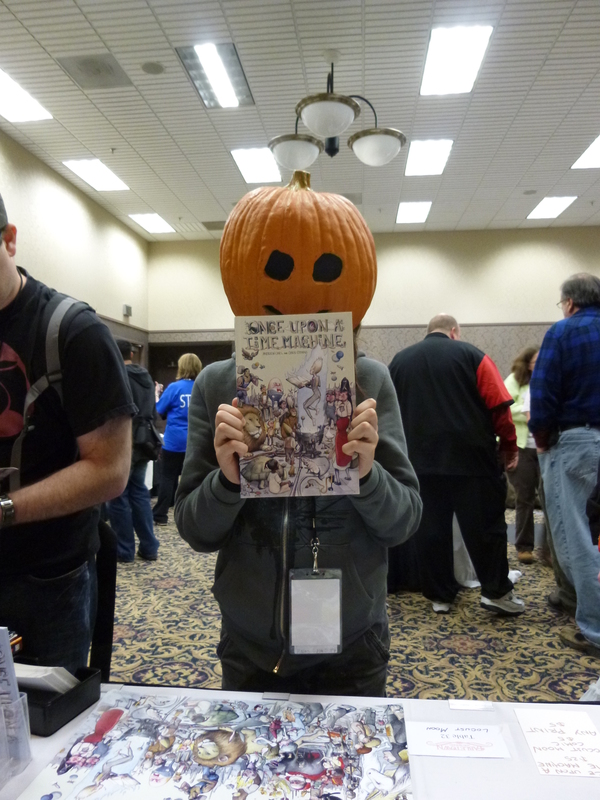 Over on the Locust Moon blog, Chris Stevens provided a wonderful reaction piece to our unforgettable time in Fabletown (née Rochester), Minnesota. You really ought to read it. The journey truly started on Tuesday night, three days before Fabletown and Beyond would be underway. Josh O’Neill in Philly and I in New York, we talked on the phone like protective parents of our partner Chris. “Make sure he has all his chargers. See if Rob can tie up that banner stand so it won’t give him too much trouble.” “I feel like I should pack him a lunch in the morning.” “Fill a bag with food that’ll stay good for a few days, in case he gets hungry on the last leg.” And so on. If you haven’t read his recap yet, you might not realize that the next morning, Chris would be boarding a train from Philadelphia to Winona, Minnesota. That spelled a 30+ hour trip each way. Josh and I had it easy. We got to fly. Two things struck me within hours (really, the first hour) of my arrival in Fabletown, MN: how fascinating the indoor (post-apocalypse-ready) mini-metropolis of Rochester was, and how aggressively nice all of the people there were. But it wasn’t just the locals who treated us well. Something about Fabletown seemed to bring out the best in folks, and the good vibes permeated every nook and cranny of those subways and skyways and buildings that bled and fed into each other from block to block. Every last person we dealt with was kind and helpful – especially our international team of convention organizers, including Bill Willingham, Stacy Sinner, Mike Sinner, Stephanie Cooke, Brad Thomte, and all of those awesome volunteers. Chris covered the key events and joys of the weekend pretty wonderfully, but I thought I should share some of personal favorite photos from the weekend here, as well. 2013’s properly underway, and this Time Machine ain’t slowing down! Left to right: Andrew Carl, Josh O’Neill, Chris Stevens, and Kelly Writers House Program Coordinator Alli Katz. In January, a handful of Once Upon a Time Machine creators – Andrew Carl (Editor; writer of “John Henry”), Chris Stevens (Producer; writer of “The Boy Who Drew Cats”), Josh O’Neill (Creative Advisor; writer of “Bombus and Vespula”), James Comey (creator of “Kid Yimage and the Really Big Hole”), Rob Woods (creator of “The Venusian Shepherd Boy Who Cried Space Wolf”), and Dave Proch (artist of “A.L.I.C.E.”) – were honored to be this year’s guests of the annual Charles Bernheimer Symposium at the University of Pennsylvania’s Kelly Writers House. You can listen to a recording of our talk here, but you’ll be missing out on our visual aids and physical comedy. If you want to see some of the gang in person, though, we have some more great events coming up in March! Andrew, Chris, Josh, Charles Fetherolf (creator of “The Crossing”), and Jason Rodriguez (writer of “The Stars Are Not Wanted Now”) will be dropping by William Paterson University to chat with some art students about making comics. A students-only event…but if you’re in the area, feel free to stalk and ambush us as we find dinner thereabouts. More info’s to come, as we approach this awesome run of events!